Look at that face... I'll bet Digger's short but powerful little front legs and feet went a mile a minute to accomplish that. Gotta love 'em though. We have two weinie dogs in my family. My sister has "Quincy" a young pup named after the Jack Klugman character because of his eyes and my brother has "Rusty" named by bro's wife so he could keep him and both are of course like "Digger" and prolific diggers. TBM - I'm beginning to feel that the annullment is a pain. First, the easy parts of obtaining marriage and divorce certificates. Then baptismal records, for me not a problem, but for her, I need to get her permission and I haven't even spoken to her in almost 30 years, and the church want's me to attempt to track her down and ask her, which I personally find a violation of her present life and family. So I married a Catholic girl in her church, which I did not convert, why can't the Catholic Diocese secure her baptismal records? Maybe I'm just confused and don't really understand the whole process completly yet. And the witness part - could be a problem. I just want to do right for JSM. By the way, TBM, you have mentioned that in the past. I admire you for that, I have meant to tell you before. You are a hero to me. That is a very hard fight. I lost a fiance to that disease, he was perfect in every other way. We also lost my son's father to the same disease. My neighbor is perfectly happy the way she is. She works with a child during the day and does not drink. She comes home and makes meals for her tenants and others. She drinks during this time. She is pretty wasted by 10 PM and goes to bed about 230 or 300. She is pretty sloppy during the end. She has to be at work very late in the morning and never has a hangover. She is basically a pleasant person. She has many good qualities, but had a hard childhood, her mother, who did not raise her (her Grandparents did) will not tell her who her father is. She has lost lots of friends who died due to drugs. She is Bart's Mom. She lives for Bart (or a current rescued basset), food, and alcohol. She lives for drinking and eating lots of good food, she says this is the only things she enjoys in life (except Bart, of course) and would rather be dead than without them. When Roscoe died, she was really drinking heavily. She is also one of the most compassionate people I know. She will help anyone. The people who I know and who drink all seem to have self-esteem problems. It usually has to do with parenting/the way they grew up/were raised and the way they were treated when they grew up. I think it was Phil Donahue, who said, you are 40, 50, 60, don't you think it is time to stop blaming your parents and take responsibility for (in this case) being fat? I don't hear the people I know blame their parents, I often hear stories about the way they grew up and then start noticing a common denominator. I find this to be true with a lot of people who have depression/anxiety, also. Why do people with low self-esteem have to jump on the backs of young children or those who cannot defend themselves, to make themselves seem bigger? Some people walk away from abusers, others can't, they think things will change some day. When things do not change, and they run out of hope, they feel they cannot move forward. Why do people hurt their children or others who are dependent on them? They cannot defend themselves. Like these young kids who wet the beds and then get murdered for it. Why don't they put diapers on these little ones if the parent cannot handle it and they know they can't? The kids are asleep, they don't know what they are doing. They don't make the parents/caretakers angry because they enjoy being abused. Where is common sense in all of this? Bearly - having worked with many alcoholics through the years and knowing many more, your assessment is correct as to the PERCEPTION of the past. Many times when the people recover they find that the past is not what they said it was (or thought it was). We alcoholics main problem is that we think we are the center of the universe. We think that everything done is about us - the best example is if two people get into a fight and one is an alcoholic, no matter who started it the alcoholic will blame the other person. So, many appear to have low self esteem - truth is that they are filled with fear - of not getting what they want, of losing what they have. "Normal" people work around these issues = we do not - we blame, ignore and drink to fix them. Also, most alcoholics, when sober, are talented and sweet people - but they are lost in the fear and resentment. I feel almost worse for the people around the alcoholic as I do for the alcoholic. Both are baffled by the problem, neither have a solution. I can go on all day about the subject. Bearly - feel free to get my email from Klaas and email me anytime. Thanks, TBM. Just don't want to lose someone else I love to this awful disease, but it looks inevitable. While she was away, I have missed her. I have taken care of Bart several times, the sitter needed a lot of time off, she did not work as many hours as she promised. She does have 2 other roommates that are there some of the time. He is feeling much better now. Sounds like fun. Do you have to have another internet connection for when you are driving in the car? I download books from our public library...and my favorite app is Words with Friends. Like scrabble - it's fun! Hey...I love that game..we need to hook up for games! My son plays that - since I can not draw a stick person I think that would not work for me! He loves it though. Well since I don't have an iPad, only an iPhone, try drawing on the phone, lol. Much harder than on an iPad. Prayers for everyone who needs them, I think that is everyone! Slept in this morning -- what a nice feeling. Going to Mom's later today and taking dinner of roast beef and mashed potatoes. Tomorrow morning going with Mom to our family church for a baptism. I have the 5th Sunday off (4 a year) and it's great to be able to go to church with my Mom. Monday I am going to help my friend Dennis do some painting (I enjoy painting) and then Tuesday bring Connie back here. Good Lord willing there will be no stress for the next few days. Going to check on Connie today. I think she is just upset and concerned about Adam. But if she is still hurting, I will take her to the doctor on Monday. Hope everyone has a blessed weekend. Trimm, so good to see you and Digger, even if he is up to his digging self! Muffy, glad you weren't hurt in your accident. My prayers to all as I do lift us all up into the throne room filled with mercy and grace -- and I forgot who asked about my prayer closet, it isn't a closet but a little sanctuary in my bedroom. I have a photo of my family, a cross, some stones of importance to me, a hatpin and stand (from great-grandmother) a flower arrangement, etc. and a list of all those who I am praying for and about. It is a very sacred place and time when I am there. I sit in front of it and pray and meditate. I used to have an actual closet with things arranged in it, but in this parsonage there is no room. Just passing it during the day brings calm to my spirit. Thank you all for your thoughts and prayers for my family and me. They are the richest treasures we can give to one another. Just to be clear, that was another one of my photoshopping "jokes." Not a real picture from Trimm. 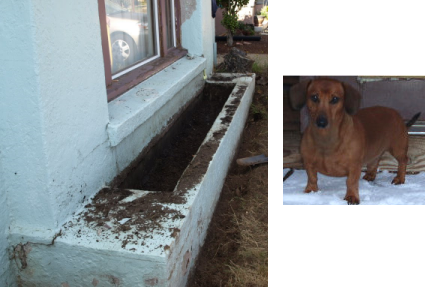 I took the dug up flowerbed image below, added some flowers and added an image I saved of Digger to make it. I, for one, have missed hearing about Digger's escapades. He's such a character! Oh, okay Brandi I could see the real Digger's image was set onto the photo, but I didn't know it wasn't really his handiwork. 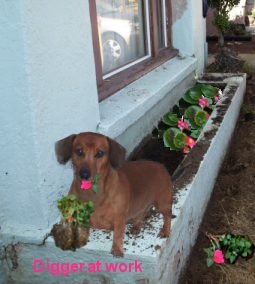 Who knows, Digger may have even dug up more than your photoshop image suggested! And I forgot to add, I miss hearing about Digger's escapades too. It was me who asked about the prayer closet. Thank you so much for your answer. Wishing you a peaceful week. Prayers for all monkeys in need. I've spent the past whole week, off and on, completing the petioner's questionnaire - formal process for the Tribunal Process for the Diocese of Dallas so that I might have my first marriage annuled so that I might marry JSM in her church so she can take her Holy Sacrements again. I had to answer 153 questions, sure some were N/A, but it was still very emotionally draining and I think brought JSM and me closer together. She's saying her Rosary right now, as she just asked me if I want her to contact my ex-wife for me in regards to submitting the ex's baptismal record to the church for required documentation. I have not been in contact with my ex for almost 30 years and wanted to write her a letter first, but I think JSM is feeeling strnegnth right now so God bless her. Still need to try to secure two of my other four witnesses for the tribunal process - the two I have so far are my sister and my BIL. Will try to get incontact some way my ex's maid of honor and one of her cousins to be ther witnesses. PLEASE pray for JSM. I'm keeping you and JSM in my thoughts and prayers as you work through this CC. Phone # for my ex, her sister, and one of her brother's went o a dental clinic. Another phone # for another brother was diconencted with no further info. Phone # for younger brother went to a fax machine. Another # to another brother was a wrong #. Phone # at her maid of honor - unanswered but I left a detailed message - hopefully they can provide some contact info. Page created in 6.11 seconds with 19 queries.